Incan architecture is the most significant pre-Columbian architecture in South America. The Incas inherited an architectural legacy from Tiwanaku, founded in the 2nd century B.C.E. in present-day Bolivia. A core characteristic of the architectural style was to use the topography and existing materials of the land as part of the design. The capital of the Inca empire, Cuzco, still contains many fine examples of Inca architecture, although many walls of Inca masonry have been incorporated into Spanish Colonial structures. The famous royal estate of Machu Picchu (Machu Pikchu) is a surviving example of Inca architecture. Other significant sites include Sacsayhuamán and Ollantaytambo. The Incas also developed an extensive road system spanning most of the western length of the continent and placed their distinctive architecture along the way, thereby visually asserting their imperial rule along the frontier. Inca buildings were made out of fieldstones or semi-worked stone blocks and dirt set in mortar; adobe walls were also quite common, usually laid over stone foundations. The material used in the Inca buildings depended on the region, for instance, in the coast they used large rectangular adobe blocks while in the Andes they used local stones. The most common shape in Inca architecture was the rectangular building without any internal walls and roofed with wooden beams and thatch. There were several variations of this basic design, including gabled roofs, rooms with one or two of the long sides opened and rooms that shared a long wall. Rectangular buildings were used for quite different functions in almost all Inca buildings, from humble houses to palaces and temples. Even so, there are some examples of curved walls on Inca buildings, mostly in regions outside the central area of the empire. Two-story buildings were infrequent; when they were built the second floor was accessed from the outside via a stairway or high terrain rather than from the first floor. Wall apertures, including doors, niches and windows, usually had a trapezoidal shape; they could be fitted with double or triple jambs as a form of ornamentation. Other kinds of decoration were scarce; some walls were painted or adorned with metal plaques, in rare cases walls were sculpted with small animals or geometric patterns. Water engineer Ken Wright estimates that 60 percent of the Inca construction effort was underground. The Inca built their cities with locally available materials, usually including limestone or granite. To cut these hard rocks the Inca used stone, bronze or copper tools, usually splitting the stones along the natural fracture lines. Without the wheel the stones were rolled up with wood beams on earth ramps. Extraordinary manpower would have been necessary. Hyslop comments that the 'secret' to the production of fine Inca masonry “…was the social organization necessary to maintain the great numbers of people creating such energy-consuming monuments.” It is speculated that the stones were swung into place using friction to create perfectly convex and concave sides. Visible marks of facture like stone bosses were made using rope; these elements demonstrated the artistic value of labor and the power of Inca rule. Another building method was called "pillow-faced" architecture. The Incas would sand large, finely shaped stones which they would fit together in jigsaw like patterns. Pillow-faced architecture was typically used for temples and royal places like Machu Picchu. Ashlar masonry was used in the most sacred, elite Inca structure; for example, the Acllawasi ("House of the Chosen Woman"), the Coricancha ("Golden Enclosure") in Cuzco, and the Sun Temple at Machu Picchu. Thus it seems that ashlar may have been more greatly valued by the Inca, perhaps considered more difficult than polygonal ("pillow-faced") masonry. Though polygonal masonry may be aesthetically more impressive, the facture of ashlar masonry tends to be unforgiving to mistakes; if a corner is broken in the process it can be reshaped to fit into the mosaic of polygonal masonry whereas you cannot recover a damaged rock in ashlar masonry. Inca architecture is strongly characterized by its use of the natural environment. The Inca managed to seamlessly merge their architecture into the surrounding land and its specificities. At its peak, the Inca Empire spanned from Ecuador to Chile and Argentina. Yet despite geographic variances, Inca architecture remained consistent in its ability to visually blend the built and natural environment. In particular, Inca walls practiced mortarless masonry and used partially worked, irregularly shaped rocks to complement the organic qualities and diversity of the natural environment. Through the dry fitted masonry techniques of caninacukpirca, the Incas shaped their stone to conceal natural outcrops, fit tight crevices, and ultimately incorporate the landscape into their infrastructure. The Inca also used natural bedrock as their structural foundations (to help keep the buildings stable). This pragmatically stabilized their structures built in the Andes mountain range of South America, while aesthetically disguising the boundaries between mountain and edifice. In combination, the diversity of stone shape, materiality, and facture all furthered the naturalistic illusion of the Inca's built environment. 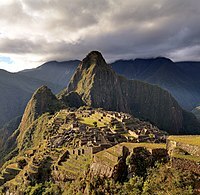 Inca employment and integration of the natural environment into their architecture played an essential role in their program of civilizational expansion and cultural imperialism. Patronage of powerful elites and rulers of the Inca empire was a major impetus behind the construction of Inca structures, and much of the remaining architecture we see today was most likely royal estates or mobile capitals for Sapa Inca to inhabit. The Sapa Inca naturalized and asserted their political rule through their palaces' aesthetic appeal to a reciprocal relationship between their imperialism and the earth itself. The blended, architectural aesthetic colored their political expansion in a sense of inseparable, timeless, and spiritual authority. For example, in the royal estate of Chinchero, the Incas adapted their large-scale earthwork and massive stone construction to the land's dramatically steep valley in order to create intense, visual drama. Similarly to the architecture of other mountainous Inca citadels, such as Machu Picchu, the Chinchero estate's dynamic construction into the severe landscape demonstrated the raw, physical power of the Incas, and projected an authoritative aura for those who approached. ^ Dean, Carolyn (2007). "The Inka Married the Earth: Integrated Outcrops and the Making of Place". Art Bulletin. LXXXIX: 502–517. ^ a b c d Dean, Carolyn (2007). "The Inka Married the Earth: Integrated Outcrops and the Making of Place". The Art Bulletin. 89 (3): 502–518. doi:10.1080/00043079.2007.10786358. JSTOR 25067338. ^ Hyslop, Inka settlement, pp. 11–12. ^ Hyslop, Inka settlement, pp. 5–6. ^ Hyslop, inca settlement, p. 6. ^ Gasparini and Margolies, Inca architecture, p. 134. ^ Hyslop, Inka settlement, pp. 7–8. ^ Hyslop, Inka settlement, p. 8. ^ Hyslop, Inka settlement, pp. 9–10. ^ Hyslop, Inka settlement, pp. 10–11. ^ Hyslop, Inka settlement, pp. 16–17. ^ Hyslop, Inka settlement, p. 17. ^ Gasparini and Margolies, Inca architecture, pp. 181, 185. ^ Gasparini and Margolies, Inca architecture, p. 187. ^ Hyslop, Inka settlement, p. 12. ^ Protzen, Inca architecture, p. 211. ^ Rowe, An introduction, pp. 24–26. ^ Agurto, Estudios acerca, pp. 144–175. ^ Hyslop, Inka settlement, p. 15. ^ Gasparini and Margolies, Inca architecture, p. 25. ^ Gasparini and Margolies, Inca architecture, pp. 78. ^ Gasparini and Margolies, Inca architecture, pp. 12–13. ^ Hyslop, Inka settlement, p. 23. ^ Kendall, Aspects of Inca architecture, p. 352. ^ Hyslop, Inka settlement, p. 20. ^ Dean, Carolyn. "The Inka Married the Earth: Integrated Outcrops and the Making of Place". eds.a.ebscohost.com. Retrieved 2018-02-20. ^ Nair, Stella (2015). At Home with the Sapa Inca: Architecture, Space, and Legacy at Chinchero. University of Texas Print. ISBN 1477302506. ^ a b c "Rock and Rule | A Culture of StoneInka Perspectives on Rock | Books Gateway | Duke University Press" (PDF). read.dukeupress.edu. Retrieved 2018-04-12. ^ a b c d e f Nair, Stella (2015). At Home with the Sapa Inca : Architecture, Space, and Legacy at Chinchero. University of Texas: University of Texas Press. p. 6. ISBN 9781477302491. ^ Niles, Susan A. (1987). Callachaca: Style and Status in an Inca Community. University of Iowa: University of Iowa Press. ISBN 9781587291685. ^ "IntroductionComing to Terms with Inka Rocks | A Culture of StoneInka Perspectives on Rock | Books Gateway | Duke University Press" (PDF). read.dukeupress.edu. Retrieved 2018-04-12. (in Spanish) Agurto, Santiago. Estudios acerca de la construcción, arquitectura y planeamiento incas. Lima: Cámara Peruana de la Construcción, 1987. Dean, Carolyn. "The Inka Married the Earth: Integrated Outcrops and the Making of Place". Art Bulletin. LXXXIX: 502–517, 2007. This page was last edited on 10 April 2019, at 06:28 (UTC).